2019 New Season Schedule is out! 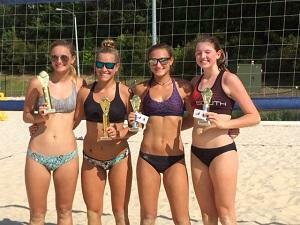 Crystal Coast Beach Volleyball has landed three Carolina Region tournaments for junior players in eastern NC. March 30th 8 am with 12u, 14u playing. 16U and 18U play starts at 2 pm on our new 8-court complex. April 6th with 8 am start for 12U and 14U and 16u and 18u play beginning at 2 pm. Congratulations to our winners and all players who participated in such a beautiful day at Creekside Park in New Bern! Our next tourney will be June 2nd and we do expect a packed house so register now and reserve your place at Creekside Park, home of the Carolina Region Beach Volleyball Park! REGISTRATION IS NOW CLOSED! YOU CAN SIGN UP BUT YOU WILL BE ON A WAITING LIST. THANK YOU! Hope to see on the Beach at Creekside on April 28th! Hi all. We will reschedule the April 7th tourney at a later date. For now, we will begin taking registration for the 4/28 tourney at Creekside with all age divisions. We are ready to go at on Saturday, April 7th at 8 am with 16U at Creekside. We are trusting that if we begin by 8:30 am, we can be done before the rain sets by noon. The 2018 High School Beach season is upon us with Creekside Park hosting another great year of Eastern Conference volleyball that includes schools such as charter member Epiphany School, New Bern, West Carteret, East Carteret, Parrott, Greenville Rose, and Croatan along with new comers Perquimons, Conley, and Currituck. As we move closer to Spring, the 8th edition of the Carolina Region Jr Beach Tour will be starting up soon. The tour schedule has just been released. Learn more about the complete tour schedule and what to expect this year below. Hard to believe but the 8th edition of the Carolina Region Jr Beach Tour is just around the corner. The tour has grown immensely since its 1st year, which fielded a handful of events and a couple hundred teams. Now the tour annually has close to 40 events with 1200+ teams participating all across the state. Over 30 events with each offering at least 1 bid per age division to the regional championships in July. First event starts in March with events on almost every weekend until early August. Open and AA divisions/bids per age division. In order to better support the growth of interest in the sport, events featuring 2 playoff brackets for an age division (Open -aka Gold - and AA - aka Silver) will offer bids to top finishers in each of those sub-divisions for the regional championships. This is at the discretion of each tournament host based on their space and time restrictions in order to accommodate. 2 events that make up a Beach National Qualifier in our region that will offer up to 4 bids per age division to the National Open (top) division at the National Beach Tour Championships which will be held in Siesta Key, FL over July 19-24. National Open - featuring teams earning bids from approx 15 Beach National Qualifier events across the county, one of which is in North Carolina. Regional Open - featuring teams earning bids from each of the 40 regional USAV associations that hold Beach Regional Qualifiers. Carolina Region has 5 events serving as Beach Regional Qualifiers which will give out a total of 5 bids per age division. Patriot - featuring any teams wishing to participate at nationals who did not earn a bid to the other divisions. 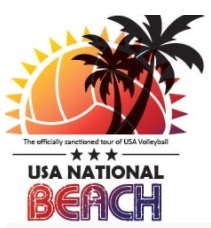 We invite everyone to visit the National Beach Tour to learn more about what it is, how national will be setup, and the new ranking system that combined past results from the USA Beach and American Beach Tour ranking systems. As the season progresses, more info will be shared on this site..
Chillin' with our favorite Olympians, Kerri Walsh-Jennings and April Ross.